The present Cathedral church is at least the third to occupy the site.Any Byzantine church must have perished during the Arab rule (870–1127). In 1127, the islands were conquered by the Normans and then, through marriage and maneuvre, they were inherited in turn by the powerful dynasties of Swabia (1194), Anjou (1266), and Aragon (1282). The Castrum is mentioned in a report of 1241 when it was the only fortified shelter on the island in times of attack. This report was compiled by Giliberto Abbate, who headed the local administration on behalf of Emperor Frederick II. The term castrum denotes that the edges of the cliffs were presumably fortified and that there was a parish church, dwellings, and some kind of entrance with ditch and drawbridge. A church within the castrum functioning as a parish church is attested to in a will made in 1299 by Guillelmus di Malta, at the time vice-Count of Malta. 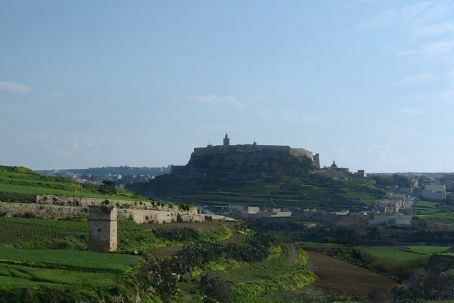 The will was drawn within the Gozo Citadel. During the rule of Aragon (1282–1530), the Citadel steadily increased in importance. Its development suffered a setback in September 1429, when a large Berber army led by Qajd Ridwan ravaged the archipelago for three days. There was however a speedy recovery. By 1435, its ecclesia maior or major church had become a matrice: another parish had originated from it. The will of Nuncio de Episcopo of 12 October 1435, refers to the Sanctae Mariae Matricis Ecclesiae, the Mother-Church of Gozo, dedicated to the Assumption of the Virgin Mary into Heaven. After this first mention, references to the Matrice become more and more frequent and they all attest to its antiquity and importance. The medieval Matrice consisted of a single nave without aisles or transepts. The initiative for its enlargement was taken by the noble families of Gozo. Needing a decent place for their burial, they bought property adjoining the Matrice, raised a chantry on the site, and annexed it to the church. The first chantry, a chapel endowed for the saying of masses for the soul of the testator and others buried within, was added by the Noble Paula de Navarra after 21 August 1494; a second, by the Noble Francia de Pontremolo after 10 March 1501; a third, by the Noble Pietro Mompolao after 19 August 1532; and a fourth, by Notary Giovanni Castelletta after 7 January 1543. The Turks ransacked the church in July 1551, yet by September 1554, it was functioning again. The Citadel and its Matrice flourished once more. On 6 June 1623, Bishop Baldassarre Cagliares established a Collegiate Chapter within the church. Pope Alexander vii reaffirmed this first Collegiate of Gozo on 20 October 1663. A collegiate church is one served by a body of secular clergy who are bound to the daily chanting or recitation of the Divine Office in choir. The ecclesiastical authorities began harbouring plans for the building of a new church in the last quarter of the seventeenth century. The process has to be hastened when the structure was damaged by a severe earthquake on 11 January 1693. The foundation stone of the present Cathedral was laid on 21 September 1697 by the Archpriest Nicholas Natale Cassia-Magri. Gafà had prepared a scale model of the new building, which allowed work to continue uninterrupted after his death early in 1703. The new church was officially inaugurated on the eve of the Assumption, 14 August 1711. It was dedicated by Bishop Giacomo Cañaves in a twenty-four-hour-long ceremony on 11 October 1716. Archpriest Cassia-Magri and his successors proceeded to enhance and embellish the church with works of art. On 10 June 1798, General Bonaparte ousted the Knights from Malta, but in September the Maltese rose against the French. The Gozitan uprising was led by the Archpriest of the Matrice Saverio Cassar, who succeeded in incarcerating all the French troops on the island within the Citadel walls. On 28 October, the French surrendered. For nearly two years Gozo became an independent country known as La Nazione Gozitana. This came to an end on 5 September 1800, when British rule (1800–1964) was ushered in. On 16 September 1864, Pope Pius ix established the diocese of Gozo and Comino. The Matrice was declared the Cathedral of the new diocese. A cathedral church is one that is presided over by a bishop and in which the bishop has its cathedra or throne. The faithful of the diocese regard the church as the Mother of all churches in the diocese. The cathedral church is served by a chapter or body of canons whose duty it is to chant the Divine Office daily in choir. The present Cathedral Chapter is made up of eighteen canons who have the title of Monsignors. Since 1864, Gozo has had eight bishops. The Cathedral, a fine baroque structure in the form of a Latin cross, is built entirely of the local limestone. It was raised between 1697 and 1711 on a plan by the Maltese architect Lorenzo Gafà (1630–1704). The façade, similar to Vignola’s Chiesa del Gesù, Rome, is framed by quoin pilasters topped by inverted urn finials. Within this frame, matching blind panels surrounded by up-sweeping parapets flank a dominant centrepiece, double tiered but divided by a heavy cornice. The whole steps forward by means of triple Corinthian pilasters, one upon the other, and terminating in an elaborate pediment designed as a screen to lend impressive scale to what is but a building of modest size. The richly ornate entrance with pedimented overdoor is echoed above by a deeply recessed niche with a statue of Our Lady. Instead of bell towers, a tall campanile with five bells is attached to the north east side. Very graceful and well-proportioned, the interior carries all Gafà’s characteristics: the serried groups of tall pilasters raised on high bases, the rich entablature and the carved attic which lifts the vaults higher, the vault intersected in each bay to allow adequate light from cross windows above the entablature and the semicircular apse. A flat ceiling in perspective closes the aperture of the dome. The end result: a spatially modest interior giving an impression of muted.